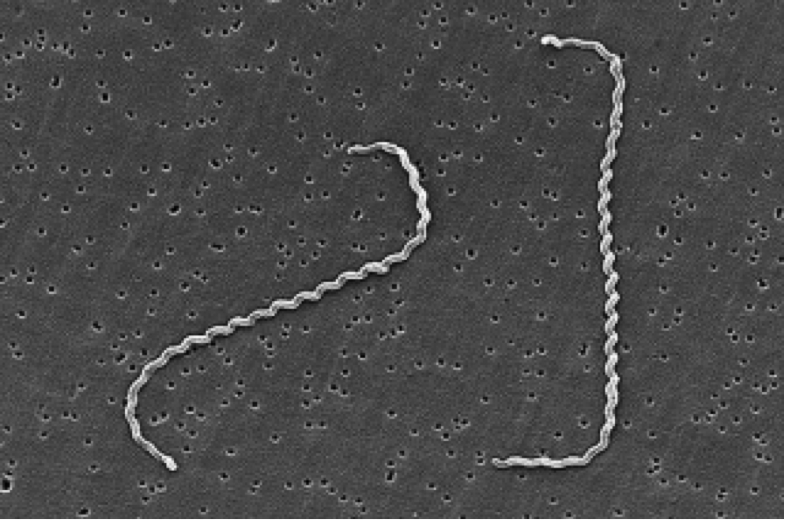 Leptospira interrogans causes leptospirosis. This disease is a zoonosis affecting many animal species and it can be transmitted to humans. These agents of disease, called leptospires, are a type of spirochetes, highly motile cylindrical cell bodies that grow in presence of oxygen and use axial filament rotation for motility (see Figure 1). L. interrogans is found worldwide, but mostly in hot and humid regions (e.g Asia, Latin America and Africa). This species encompasses many serovars, i.e a distinguishable variant of L. interrogans that can be pathogenic (cause disease) or not. L. interrogans can be transmitted to humans by skin or mucosal contact with urine-contaminated soil or fluids from contaminated animals (see Figure 2). Leptospires migrate through the host tissues, invade cells and reach important organs of mammals. They activate macrophages, immune cells that protect the host by eating and digesting anything foreign encountered. Activation happens through binding of bacterial surface receptors that elicit the host immune response. Antibodies specific for lipids exposed on the bacterial membrane (lipopolysaccharides) are secreted against the leptospires and provide protection against reinfection. Figure 2: Leptospirosis transmission route. Reservoir for L. interrogans transmission include rodents species, wild and domestic animals, as well as contaminated environment. Humans are accidental hosts and do not spread the microorganism in the environment ; they are not reservoirs for transmission. Pathogenic leptospires penetrate wounded skin or mucous membranes, enter the bloodstream and disseminate throughout the body tissue. 1) The asymptomatic incubation phase; leptospires gain the bloodstream. 2) The pre-icteric phase or the invasion of the host tissues. 3) The icteric phase where non-specific antibodies appear and symptoms increase and decrease. Leptospirosis is usually poorly diagnosed due to the large variety and non-specificity of symptoms. Many methods of diagnosis exist, but the three most common are: polymerase chain reaction (PCR), microscopic agglutination test (MAT) and rapid genus-specific tests. The PCR method detects leptospires’ DNA in the analyzed patient sample. The MAT technique is the reference test; it detects antibodies against leptospires present in the sample. Rapid genus-specific tests are faster than MAT method at detecting unspecific antibodies, but complete diagnosis requires confirmation with the MAT technique. Leptospirosis represents a public health threat as a potential epidemic and newly emerging infectious disease. Reservoirs of this zoonosis include rodents, livestock and dogs (see Figure 2). Its incidence is normally higher in tropical and subtropical areas like South America due to climatic conditions; outbreaks from various serovars have been linked to floods, hurricanes or heavy rainfall. The number of cases worldwide is not known precisely, partly due to difficulties in establishing clear diagnosis, but recent estimates indicate more than 500,000 cases annually reaching 10% mortality. Leptospirosis may be an occupational hazard through direct or indirect urine contact. This transmission mode threatens pit workers, outdoors workers like farmers and animal contact workers like veterinarians. This disease also represents a recreational hazard for swimmers. For example, several leptospirosis outbreaks occurred following triathlons. L . interrogans different serovars have their own virulence factors suspected to play a role in leptospirosis causation. Among these virulence factors, we find toxin production. A toxin is a poisonous substance secreted by a pathogenic bacterium to harm host cells. Haemolysins, a toxin category, lyse or burst host red blood cells and are produced by L. interrogans. Bacterium attachment to host epithelial cells (i.e cells covering body surfaces such as skin, mucosa, etc.) also represents a virulence factor. L. interrogans especially attaches to renal epithelial cells, but host immune cells such as macrophages can fight this by engulfing invading bacteria. Surface proteins (lipopolysaccharides) allow L. interrogans to be recognized as pathogenic by macrophage and elicit an immune response. This response consists of antibodies production; those target and attack specifically the infecting leptospires. However, our bacterium defends itself by killing macrophages through elevation of their intracellular calcium levels. Last but not least, host antibodies may harm the host itself since L. interrogans can disappear from bloodstream. Antibodies could start attacking host red blood cells or platelets; this last virulence factor is immune-mediated and aggravates disease symptoms. Various antibiotics usually clear L. interrogans depending on the gravity of the infection (e.g penicillin (or penicillin G), doxycycline, ampicillin and amoxicillin). A few new antibiotics are being tested (e.g cefepime, ertapenem, norfloxacin). All antibiotics used and tested so far seem to control the disease. Also, vaccines made from killed bacteria are used in humans and animals to promote temporary immunity against leptospirosis. Assez, N., Mauriaucourt, P., Cuny, J., Goldstein, P. and Wiel, E. 2013. Ictère fébrile… et si c’était une leptospirose. À propos d’un cas de L. interrogans Icterohaemorrhagia dans le Nord de la France. Annales Françaises d’anesthésie et de Réanimation. 32: 439-443. Bharti, A.R., Nally, J.E., Ricaldi, J.N., Matthias, M.A. et al. 2003. Leptospirosis : a zoonotic disease of global importance. The Lancet Infectious Diseases. 3: 757-771. This entry was posted in Uncategorized on November 27, 2015 by laitue12.